The 1st American Thanksgiving happened in 1621 after the Pilgrims’ 1st successful harvest of maize. (Historic tip: Use fish fertilizer.) Most commonly known as corn, this grass was domesticated by the Mayans over 9,000 years ago. 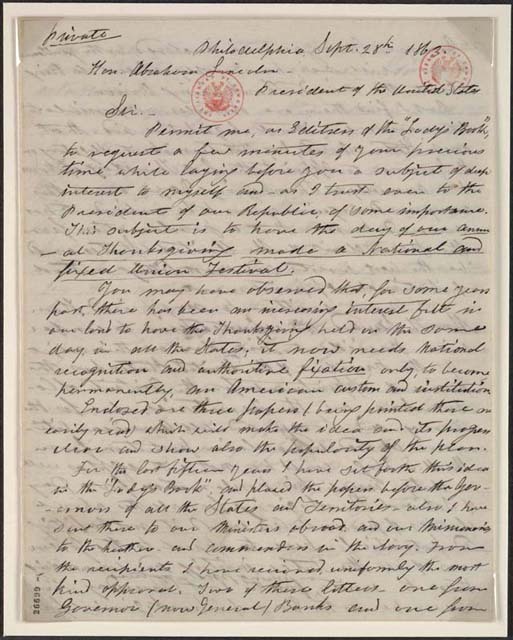 However, it wasn’t until 1863 that Abraham Lincoln established Thanksgiving as a permanent national holiday and only after Sarah Josepha Hale campaigned 15 years for its establishment. Ms Hale, America’s first female novelist and a champion of civil rights, demanded that Thanksgiving become a national holiday. What Sarah possibly didn’t know at the time was just how important it is to give thanks! But Thanksgiving is also about community and food. Sadly, the first Thanksgiving was devoid of pumpkin pie. Instead, Governor William Bradford served corn, deer, and waterfowl. The Pilgrims shot the waterfowl themselves but Squanto, the last member of the Pawtuxet tribe, taught them how to grow the corn and the deer were a gift from the guest of honor, Chief Massasoit and several members of the Wampanoag tribe. It was this combination of inter-cultural sharing and expressions of gratitude which made Thanksgiving so important to early Americans. As Sarah put it, “It is a festival which will never become obsolete, for it cherishes the best affections of the heart – the social and the domestic ties. This Thanksgiving we hope that you’ll continue our great American tradition. Appreciate what you have daily. Donate to a local food bank. Share your friendship this Thanksgiving. Ps. About that pumpkin pie – We have Sarah Josepha Hale to thank for that too. It was her recipe that made it so popular. Take out the seeds, and pare the pumpkin or squash; but in taking out the seeds do not scrape the inside of the pumpkin; the part nearest the seed is the sweetest; then stew the pumpkin, and strain it through a sieve or cullender. To a quart of milk, for a family pie, 3 eggs are sufficient. Stir in the stewed pumpkin with your milk and beaten-up eggs, till it is as thick as you can stir round rapidly and easily. Sweeten with molasses or sugar; add 2 teaspoonsful of salt, 2 tablespoonsful of sifted cinnamon, and 1 of powdered ginger; but allspice may be used, or any other spice that may be preferred. The peel of a lemon grated in gives it a pleasant flavor. The more eggs, says an American authority, the better the pie. Some put 1 egg to a gill of milk. Bake about an hour in deep plates, or shallow dishes, without an upper crust, in a hot oven. Warning: Consuming raw or under-cooked food, including eggs, may increase your risk of food-borne illness. Why Do We Celebrate Thanksgiving is presented by AccidentAttorneys.org. Be sure to share with your friends!